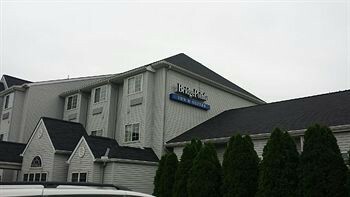 Property Location With a stay at BridgePointe Inn & Suites in Northwood, you&apos;ll be close to Toledo Zoo and Willis B Boyer Museum. This hotel is within close proximity of Fifth Third Field and Seagate Convention Center.Rooms Make yourself at home in one of the guestrooms featuring refrigerators. Conveniences include desks and coffee/tea makers, and you can also request cribs/infant beds (complimentary).Rec, Spa, Premium Amenities Enjoy recreational amenities such as an indoor pool and a fitness center. Additional amenities include complimentary wireless Internet access, a fireplace in the lobby, and a television in the lobby.Dining A complimentary breakfast is included.Business, Other Amenities Featured amenities include complimentary high-speed (wired) Internet access, a computer station, and express check-out. Free self parking is available onsite.